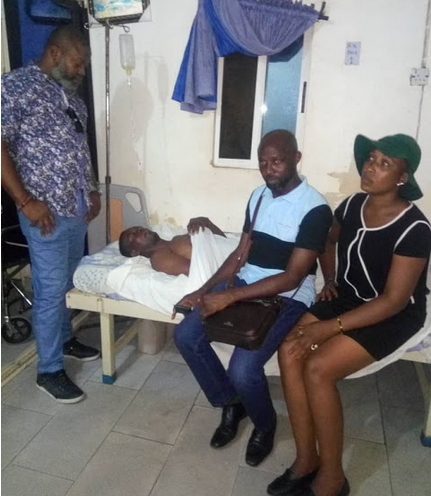 Nollywood actor, Ebere Larry Ebere a.k.a Cornel, is in critical condition and in need of N2 million to undergo a brain surgery in less than 24 hours after he was involved in a near fatal accident. 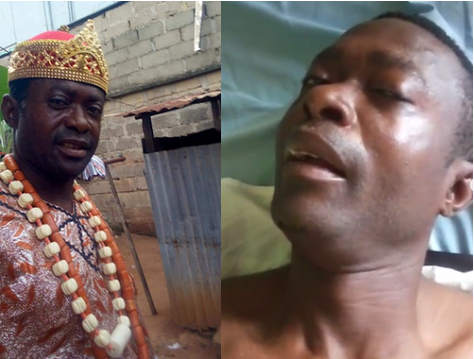 The Asaba, Delta state based actor is said to have fell off keke (tricycle) and hit his head on the road after he started convulsing inside the keke. Cornel's predicament was brought to light following an emergency appeal made on Sunday midnight by actress Brenda Eve Ndukwe, who is the Financial Secretary, Actors Guild Of Nigeria, Delta state chapter. Cornel in the hospital with Brenda Ndukwe and treasurer Delta AGN, Comrade Harry Chuma. "Help save a soul. 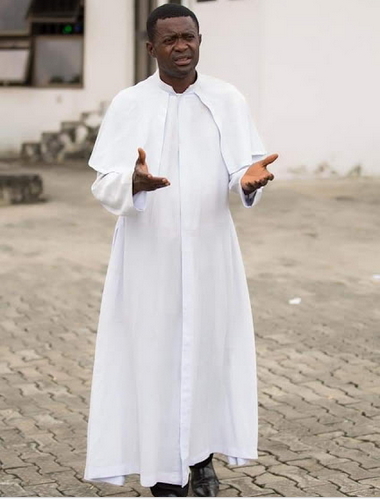 Our brother Ebere Larry Ebere(Cornel) needs your prayers and financial assistance to survive. "Cornel is a Nollywood actor based in Asaba who left his house yesterday morning for his normal duty I guess but on his way, he started convulsing while in a keke, he fell of as a result of that and hit his head at the main road but all thanks to God that there was no vehicle coming then, else it would have been a different story all together. "He was rushed to a hospital by the keke driver and some good citizens of Nigeria. With the help of AGN ID card, a call was put across to the Delta state AGN chairman, Alex Idu, who immediately left all he was doing rushed down to the hospital, he also made a deposit of 30k immediately. "Cornel was referred for a brain test and the result shows that blood has circulated almost all the parts of his brain. Am sure we all know how dangerous that is. "Cornel needs 2 million naira to under go a brain surgery within 24 hours. I don't know how best to ask for your assistance both prayers and financial assistance for the life of this young man to be saved. "Tears have all stained my cheek as I struggle to type this message here and at this time of the night. Trust me, only your support can help him live again. "For your support, pay into the account of the Financial Secretary, Actors Guild Of Nigeria Delta state. "Account- 2002340597. Name: Brenda Eve Ndukwe. Bank- Zenith. "God bless you as you respond positively in Jesus name. Amen." Brenda went further to thank the Delta AGN chairman, Alex Idu for his quick response to the situation and for depositing the sum of 30k for Cornel's treatment before the test result showed he needs brain surgery. She also thanked the Director Of Guild Services, DGS, Mr Soda Faces, and Anita Odiakose, former Miss Tourism and all the people that has contributed so far with their time and effort.